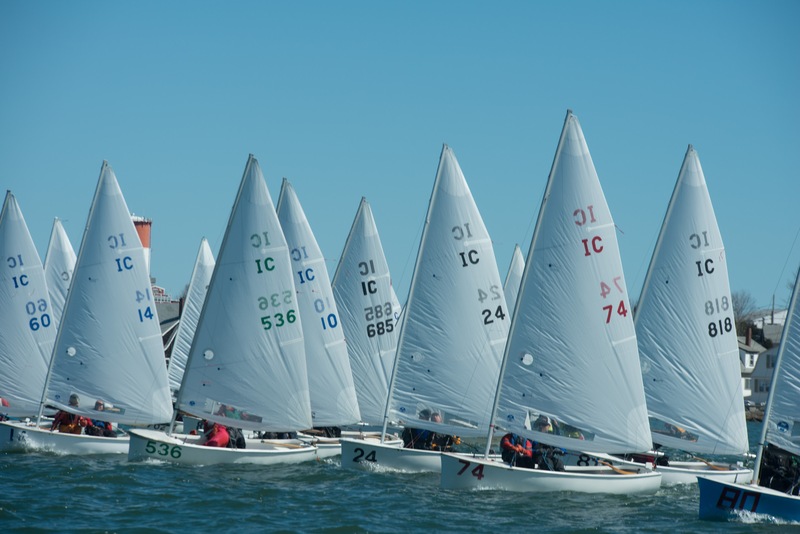 Cottage Park Yacht Club in Winthrop Massachusetts was host to this year’s Interclub Dinghy National Championship on April 8 th and 9 th . 27 boats made the trek to battle it out among some of the best dinghy sailors in the Northeast. 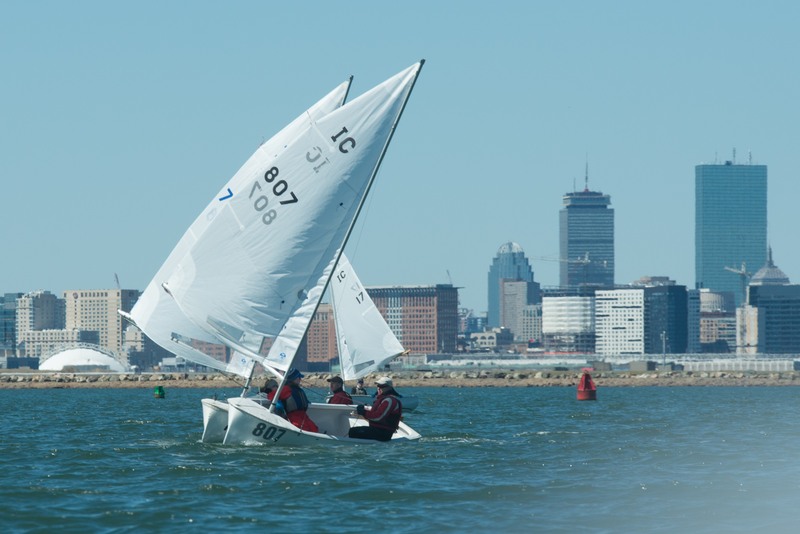 With sailing taking place right off of Logan Airport, Saturday greeted the teams with a strong breeze from the Northwest which continued to build throughout the day toping out at 25+. Although many teams were hoping the wind would die down enough to sail in the afternoon, the Race Committee smartly made the decision to cancel racing and looked for a better day on Sunday. The forecast proved correct for Sunday and with temperatures reaching the mid 60’s, the race committee under the direction of PRO Sue Hardy knocked out 10 great races in a shifty 10-15 knot breeze. 10 time National Champion Jim Bowers and crew Lydia Brown started strong and were looking good with 3 wins in the first 5 races only to fall victim to a capsize in race 6 caused by the “down draft” of an incoming plane to Logan Airport. In the ‘no-throw-out’ regatta, Bowers/Brown had to count a “29” to their scores and all hopes for an 11th National Championship were all but gone in the tight fleet. The top spot became a battle between multiple IC National Champion Steve Benjamin and Brooks Daley; 2011 IC National Champion Paul-Jon Patin and Felicity Ryan; and long-time Larchmont sailor Ted Ferrarone and Meredith Killion. In the end, it was Ferrarone/Killion who pulled away to win their first IC National Championship by 19 points. Ferrarone/Killion were by far the most consistent in the fleet with no race worse than a 6 th and finished with 37 points. Benjamin/Daley finished 2nd with 56 points and close behind was Patin/Ryan with 57 points. Rounding out the top 5 was the husband/wife team of Art and Jen Rousmaniere in 4th place with 60 points and Bowers/Brown in 5th with 66 points. Ben Cesare/Ann Patin and David Dowd/Thomas Salerno win the 2017 Midwinters held at Larchmont YC. 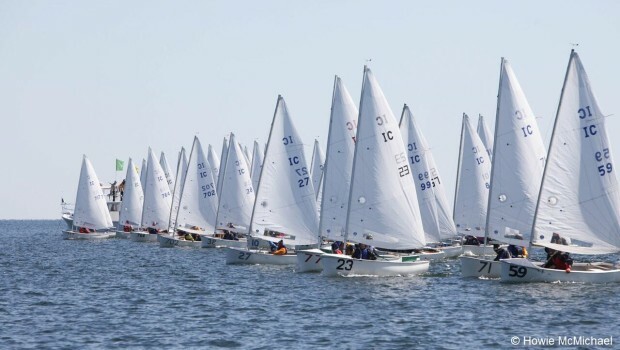 The NOR for the 2017 IC Nationals hosted by Cottage Park Yacht Club in Winthrop MA on April 8-9, 2017 has been posted and registration is now open. We are working to make this as easy as possible for visiting teams to participate by having housing, loaner boats available and even airport pick ups at Logan airport (10 minutes from the club) should you be flying in. And you won’t want to miss the Saturday night dinner with great raffle prizes!! More information will be forthcoming but if you have any questions, please don’t hesitate to contact any of the regatta organizers below. We hope you can make it! The 86th Annual New York’s Frostbite Regatta was hosted on December 31 and January 1 by the Manhasset Bay Yacht Club of Port Washington, New York. We reviewed the Notice of Race for any mention of air or water temperature parameters that might limit racing. There were none, which can only mean that if you have to ask, than perhaps frostbiting isn’t for you. The name of the event should be sufficient. Wining the Interclub class was Simon Straus with crew Anne Patin, followed by Paul-Jon Patin with Felicity Ryan with Steve Benjamin with Daley Brooks in third. The 86th Annual New Years Frostbite Regatta hosted by the Manhasset Bay Yacht Club will be held on Saturday and Sunday December 31-January 1 2017 in Port Washington, New York. Read the full Notice Of Race. Jim Bowers and Gaelen Adam won a record tenth Interclub Dinghy National Championship on April 9-10, hosted by Larchmont Yacht Club in Larchmont, NY. The weather ran the gamut, with a puffy easterly on Saturday causing the Race Committee to tuck the 44-boat fleet inside the breakwater to allow for seven chilly races in the rain on short courses, with Sunday’s sunnier skies and longer courses featuring large wind shifts and 1.5 knots of flood tide to keep competitors and the race committee on their toes over the remaining five races. Larchmont teams took spots two through eight on the podium, with Paul-Jon Patin and Felicity Ryan in second, and event chairman Jay Rhame and Katie Murphy in third. Henry Fernberger, with dad Peter as crew, won the B division, Brouck Anderson and Jack Kneisley won the C division, Ben Cesare and Nicholas Patin won the Masters division, and Jen Rousmaniere of the Winthrop fleet was named the top women’s skipper.